Emails are an interruptive form of marketing. They are on the top with TV and radio ads when it comes to annoying customers. Month after month, these emails find themselves in trash bins of unsuspecting human beings who collectively select promotional mails and simply delete them. You do that too, don’t you? So why has this powerful medium which could have been (and in some cases, is) cleverly used to increase consumers’ knowledge as well as spread brand messages become an irksome problem for both consumers and businesses? 9 banks are offering you interest-free loans. A computer has chosen you as the lucky winner of a $3,000,000 contest you didn’t enter. 6 recruiters have found the dream job for you. You have 15 “most suitable” matches across 3 dating sites. Travel to exotic locations is just around the corner as per your horoscope. 3 universities are conferring degrees in random subjects on you. Anna, Liz, Vanessa and about 50 other girls are feeling lonely and want to meet you. Or, if you’ve signed up for their services, they might be hitting you with some uninspiring welcome mails. 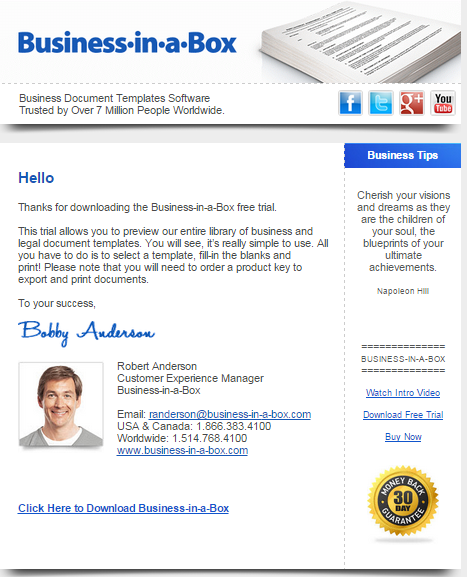 Look at the following email from Business-in-a-box. How can a vaguely motivational Napoleon quote be a “business tip”? 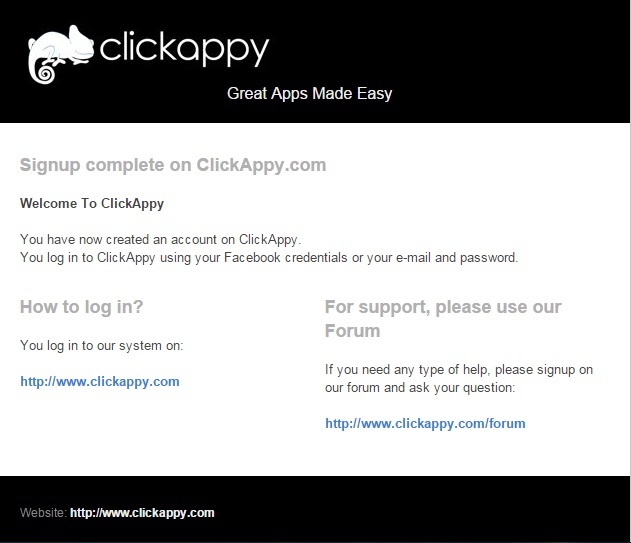 Another example is Clickappy – what a fresh name with a quirky logo to boot! I would have expected a little more ingenuity and creativity in their welcome mail. But that just tells you what people dislike, not what they like. To find a solution, it is important to discover the pattern of the problem. Why is it that emails have become such an annoyance? To get to the root of problem, a few of my friends got together and came up with small contests – Who gets the most boring emails? Who gets the highest number of unsolicited emails? Who has the cleanest inbox and who has the most junk-filled one? Many emails come with personalized subject lines such as “Jack, we have this offer just for you,” “Tracy, you will absolutely love these articles,” and so on. The fact that some businesses get on first name basis with you can be a little unsettling to many. 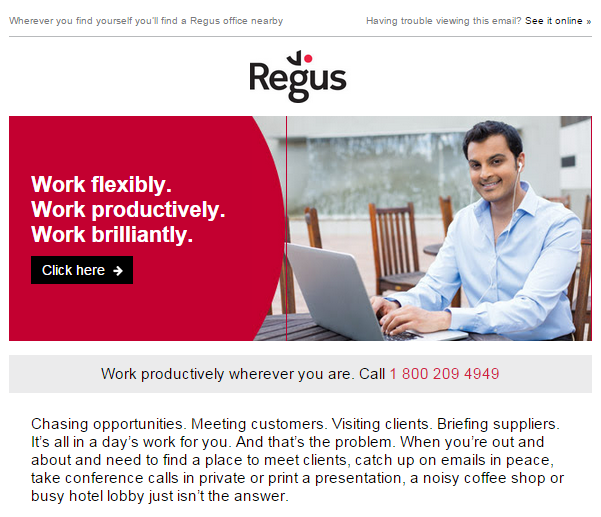 Also badly written “you” centered emails somehow end up looking like people-pleasers and diminish the company’s value. (My apologies if there is a real Magical Spa anywhere.) See how the text grabs attention with a snappy headline (which could double up as a subject line), but at the same time subtly shows off a strong customer base. 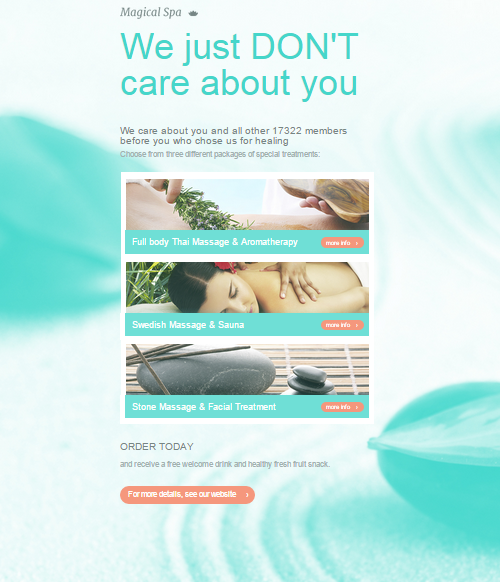 And as is regular practice with onboarding emails, it talks about the various services on offer and includes the customary first-time discount/freebie. Nothing personal about that. 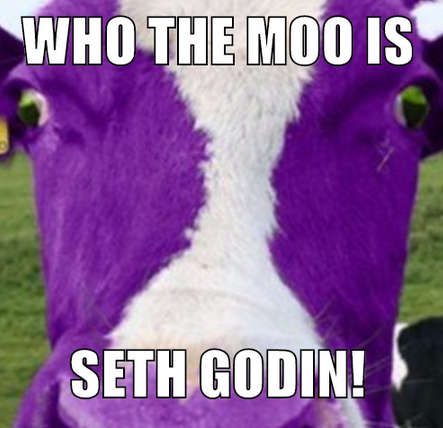 Seth Godin’s Purple Cow has sold more than half a million copies, much to the chagrin of brown jerseys that can’t seem to keep up. But there is much truth in what Seth says. Every business has to find its purple cow. So what could be the purple cow in email marketing? What could differentiate you from the hundreds of unsolicited mails your customers receive every day? Consider the example above – the dummy for a spa I created using GetResponse. Now there were hundreds of templates in there, but this one suited the business profile aptly. Most spa boutiques use such images, so it was a safe bet. However, after some mulling over, I realized that a real email marketing “strategy” and the visual didn’t really belong with each other. If I wanted to “reinvent” visual email marketing, I’d have to do something radically different, something akin to a purple (or framboise) cow! 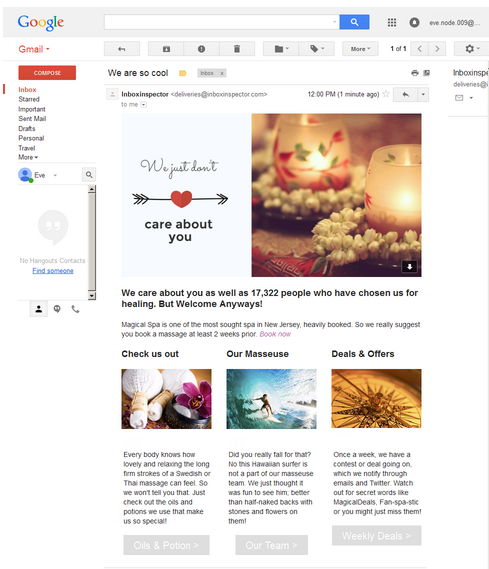 So I said goodbye to all those overused pictures of Thai massuese, candles, stones, flowers, oils and backless women and came up with this really cool but beautiful email, breaking the clutter and disrupting the usual – in other words, reinventing visual email marketing. Okay, I did use candles and flowers, but you get the idea. 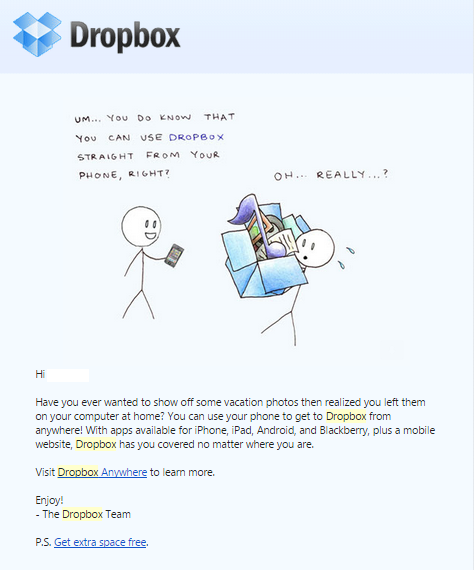 One last example: There’s nothing not to love about the stickman figures of Dropbox. They use them in ways that display sheer creativity, making even complex product enhancement updates look simple and cool. No matter how much we say interruptive is passé and rave about disruptive marketing, there’s one side of us that wants to cling to what we know, to a familiar territory. Blending the best of both worlds in one successful marketing smoothie is as close to reinventing email marketing you can get. And that’s definitely possible, as we can see in the examples. The best bet for businesses is to revolutionize email marketing one email at a time!